Aldi Novel Adilang's floating fishing hut was spotted by a passing cargo ship, the MV Arpeggio, after drifting at sea for more than a month. 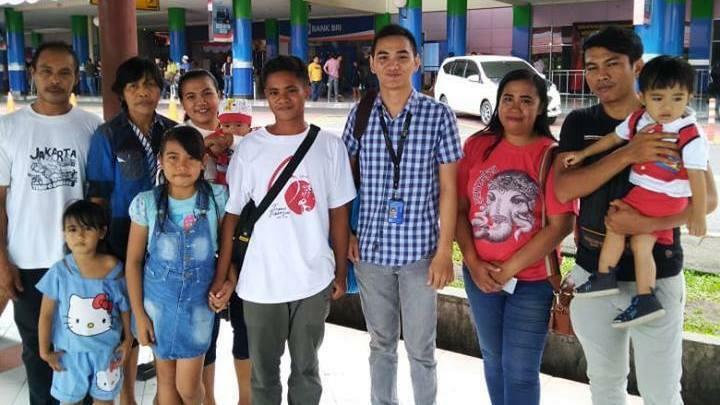 Aldi Novel Adilang (center, in white T-shirt) was reunited with his family in Indonesia earlier this month, after traveling from Osaka, Japan, to Tokyo and onward to Jakarta. For 49 days, Aldi survived by stretching out his meager supplies, reportedly subsisting on fish and partially strained seawater. He had been living aboard a floating hut called a rompong more than 77 miles off Indonesia's coast. But the line anchoring the hut snapped in high winds on July 14, turning Aldi into a castaway. 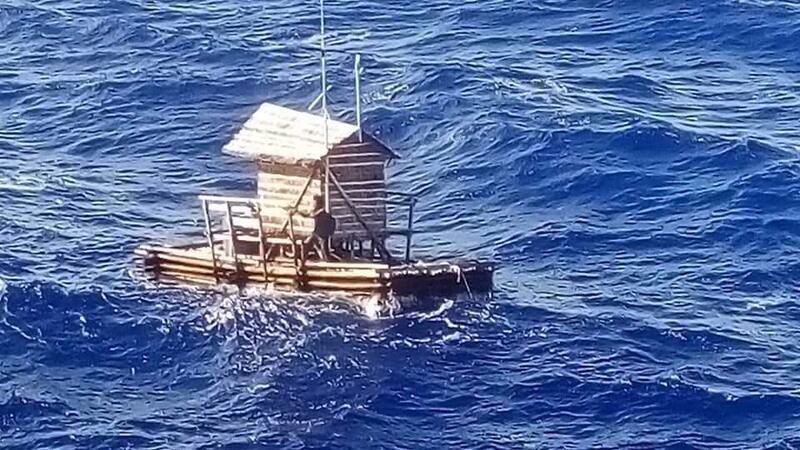 Lacking any way to steer or power the unwieldy raft that bore his hut, the 19-year-old drifted across the blue waters of the Pacific Ocean. The small hut sat on a rectangular wooden platform and was protected by a thatched roof. Inside, he had a walkie-talkie, a small stove and a generator. Aldi's supplies of food, water and fuel had been meant to last him only a week. "After he ran out of the cooking gas, he burned the rompong's wooden fences to make a fire for cooking," said Mirza Nurhidayat, Indonesia's consul general in Osaka, Japan, who was quoted by The Jakarta Post. "He drank by sipping water from his clothes that had been wetted by sea water." The crew of a passing ship, the Panama-flagged MV Arpeggio, finally rescued Aldi — an open-water maneuver in which the castaway made a desperate leap to try to grab a rope thrown from a freighter. The Arpeggio was headed to Japan, and that's where Aldi went, before finally returning home earlier this month. Aldi had been under a six-month contract to work on the floating hut, his main duty to light its lamps to attract fish at night. He had face-to-face contact with people only once a week, when new supplies were brought to him. But after his mooring line broke, he drifted for hundreds and possibly thousands of miles. "Aldi said he had been scared and often cried while adrift," Fajar Firdaus, a diplomat at the consulate in Osaka, told the Post. "Every time he saw a large ship, he said, he was hopeful, but more than 10 ships had sailed past him, none of them stopped or saw Aldi." But just after the Arpeggio passed him on Aug. 31, Aldi was able to dial his radio to a frequency the vessel was using. According to video posted by a crew member, Aldi's distress message — "Help Help Help" — reached the cargo ship's chief mate, Emmanuel Soriano, who informed the captain, Narciso Santillan — who ordered the ship to change course to carry out a rescue operation. As video of the encounter shows, the freighter dwarfed the fishing hut. It took four passes for the ship to get close enough to extract Aldi without endangering the wooden raft. To reach the freighter's deck, the young man had to cling to a life preserver in the water and then grab onto the bottom rungs of a wooden ladder so crew members could pull him free of the rolling ocean. When he was brought aboard, wearing shorts and a black Ferrari T-shirt, Aldi was given a blanket and water, followed by slices of dark bread. Within 5 minutes, he was able to stand, even managing a weak smile as someone offered a handshake. Other necessities followed, from a set of clothes to a haircut — given by the ship's cook, the Post reports. Aldi arrived at the Japanese port of Tokuyama on Sept. 6 but had to spend another night on the cargo vessel. There were concerns about a possible health quarantine, and officials rushed to arrange travel documents for him that would allow him to disembark in Japan. He traveled from Osaka to Tokyo and then flew to Jakarta, before finally making it back home. On Sept. 9, Aldi returned to his family in North Sulawesi, an Indonesian province whose islands help form the eastern ring of the Celebes Sea. The country's consulate in Osaka posted photos of the young man with his relatives in the coastal city of Manado.